Lightened up with ground turkey and laden with lots of veggies, this Instant Pot Turkey and Sweet Potato Chilli is bright and robust and ready in just 30 minutes. It is easy, comforting and kid friendly, but feel free to add some more spice if you like a kick in your chilli. Let me start by saying that this Instant Pot Turkey and Sweet Potato Chilli is not, in any sense of the word, traditional. I apologize to those purists that enjoy their traditional hot and spicy chili’s, you will not find what you are looking for here. 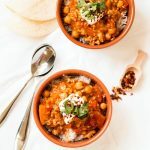 Instead, you will find a lightened up, veggie and chickpeas laden instant pot chili alternative. It is bright and robust, and using the Instant-Pot means it will take a grand total of 30 minutes to make from start to finish! Yes please! Plus it is made with a lot of ingredients you will likely already have on hand which is a huge bonus! This is a great recipe to double. I usually make a double batch and serve one for dinner and freeze the other for a day when I know I will be super busy. I just add one more minute to the cooking time and it works perfectly. No Instant Pot? No Worries!! I have included the instructions for making Turkey and Sweet Potato Chilli using an Instant-Pot (if you don’t have one of these magical pots then get one asap). But if you don’t have one, you can still make it on the stove top, it will just need to simmer away for about an hour (see notes in the recipe). If you like spice then add some more chili, I always add some to mine and leave it off for the kids. Lightened up with ground turkey and laden with lots of veggies, this Instant Pot Turkey and Sweet Potato Chilli is ready in 30 minutes from start to finish. It is easy, comforting and kid friendly. Set the Instant Pot (or alternative pressure cooker) to sauté. Add oil, and once hot add in the onions and sauté for about 3 mins. Add in the garlic and sauté for a further 1min. Add in the turkey mince and cook until browned. Once turkey has browned, add in the diced tomatoes, tomato sauce, garbanzo beans, 1/2 of the chopped red bell peppers, chopped sweet potatoes, vegetable stock, cumin, paprika and chill powder. Salt and pepper to taste and mix everything well. Seal the vent. Set to High pressure for 9 mins. Once 9 mins is finished, Quick Release and open lid. Add in the rest of the red bell pepper and stir to combine. 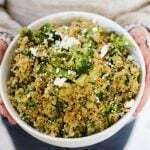 Serve over some cooked brown rice or riced cauliflower for low-carb. Add a dollop of sour cream, some diced avocado, grated cheese, chopped cilantro and more chilli flakes to serve. Complete step one and two (above) in a large saucepan. Once you get to step 3 simmer for about 30 minutes before continuing with the directions as above. Freezes well, just pop in a freezer friendly container without the rice and toppings. If your child doesn't like raw/crispy vegetables, then add in all of the red bell pepper at step two. This will be a sure hit for dinner!! Comfort food dinner for the win! Love the ease of this recipe! We made this tonight and it was wonderful! We were oit of chili powder, so we used a teaspoon of Old Bay seasoning along with the other spices. Served it over long grain and wild rice. Perfect! As I don’t own an instant pot, I will try this on the stove top! It’s just what I have been craving lately! Also, I wanted to say that I really love the pictures! I love making chilli in my Instant Pot – it tastes like it simmered all day. This sounds like a great fall recipe! It gives the best flavor doesn’t it! I loved this. Although I put the recipe into my fitness pal and it had way more calories. 264. I just wish you mentioned the serving size – is it 1 cup or 1.5 cups? that would help alot in estimating calories. I doubled the recipe so there’s no way I was going to ladle it between 12 containers to try to estimate calories. Thanks for considering! I love making this recipe as most of the items I usually have on hand so it’s easy and so tasty to make. Hi Leslie, next time I make it (which will probably be soon as we have it quite often) I will measure out the serving size for you! 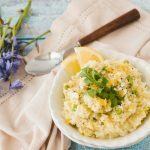 When I first came up with the recipe I didn’t have a nutritional calculator on the site so I didn’t worry about specific serving sizes, I just always go by feel. Made this – didn’t have bell pepper – and we forgot to peel the sweet potato – and it still turned out great! I won’t bother with peeling the sweet potato in the future as there was nothing bad about leaving it on and maybe we actually benefitted from some additional nutrients in the skin. Thanks very much for this great recipe! It’s a new favorite for both great taste and ease of preparation. Made this for the family tonight, it’s a hit! Oh yay 🙂 So glad it was a hit! This is, hands down, THE BEST thing I’ve eaten in a long time! The only change I made was to up the chili powder to 1 tsp. I haven’t had it over rice or with any garnishments, just eat it as is, and I can’t get enough. I love how the flavors come together and how fresh it tastes. It’s filling, without leaving you feel stuffed. Thank you so much for this recipe, my new fave! Oh thank you Amy, you just made my day 🙂 So glad you loved it!! How much is one serving? Thanks, I will be making this Chili this week! Hi Meagn, sorry I don’t weigh my servings, I just go based on how many bowls we serve up (adult size, not kid size). So for this recipe, it was 6 bowls of food, and they are largish servings. After a few modifications I now have a chili limit per day. I swapped out the chickpeas for black beans, dropped the chili powder for ancho chili powder but the biggest difference is the addition of 1 tbs of cacao powder, huge flavor boost plus you know it’s chocolate! ps on this copy of the recipe you omitted the oil and quantity, i’m curious what you used. I do t have an installer but looking to cook this on the stove or. Do kpot. I saw i. The blog that those instructions were i. The notes section and I didn’t see it. How long so I let it simmer on The stove or what temp in the crockpot? Thanks so much! Can’t wait to try it! Hi Maggie (my daughter’s name too 🙂 ), I am sorry the stovetop directions must have disappeared when I changed my recipe set-up. I will have to fix that up. In the meantime just do steps one and two in a large saucepan, and then when it gets to step three you will want to simmer for about 30 minutes before adding the red bell pepper, stirring and serving. Hope you enjoy! Very, very good. I’ve only made a half dozen recipes in my instant pot and this one has been the only outstanding success. I will bookmark this one and make again! I love this recipe! I doubled it, added drained black beans, cooked on high for 18 mins and added fresh spinach to it when it was done cooking!!! Ooh yum, love the addition of the fresh spinach, I will have to try that next time!! We add spinach wherever possible and it is perfect for this chili!! I make it and freeze some to send to our boys at University. My son ate his the first day I brought it to him. This is a healthy comfort food! Oh thats lovely, it makes my heart happy 🙂 I need to try adding some spinach next time I make it, seems to be a favorite addition among readers! This was my very first Instant Pot recipe and it was amazing!! It flashed the “burn” setting for a minute – maybe because I overfilled the pot? But then it went away. I used an extra large Japanese sweet potato (bc I love sweet potatoes) and also added corn when it was done cooking for a bit of crunch. Thank you so much! Oh yay I am so glad it worked out well for you!! It may have flashed burn if there was too much sweet potato (is there such a thing???) and not enough liquid? Glad it evened itself out though 🙂 Love the addition of the corn, always great to sneak some extra veggies in there when you can!! Just wanted to say thank you for sharing this recipe! I happened to have ground turkey and sweet potatoes on hand and was looking for Instant Pot recipes when I came across this one. It sounded good but I wasn’t sure how two little kids and a picky husband would like it… well I’m glad I decided to try it because they all loved it! Adding it to our rotation!! Is it supposed to be watery?? Did I do something wrong? I followed recipe as is…. Oh no I am sorry it turned out to be watery for you Mandy, we have never had that problem! The only thing I can think of is maybe you had a particularly watery can of tomatoes?? Yum! I made this tonight and really enjoyed it. The garbanzos were a nice substitute for kidney or black beans. Thanks for the recipe! This was the first recipe I made in my new InstantPot. I followed some of the comments I read and used 3 tsp. each of the cumin, paprika, and chili powder and since it still wasn’t at all fiery, next time I may even add some chipotles with adobo. For additional veggies, I added a cup of frozen corn and two carrots. For the diced tomatoes, I used the fire-roasted type. It was really tasty. Thanks for the recipe! This was an excellent recipe find. Even my picky teenager liked it. I made a double batch to freeze some for lunches. I served with avocado, cilantro and Monterey Jack cheese and it was excellent. Took some time to chop everything but worth it. Oh yay for feeding fussy teenagers, I haven’t reached that point yet (although I swear my 4 year old is going on 13 some days). Thanks so much for taking the time to pop back and leave a comment! Eating this as I type, it’s SO GOOD! the kids are gobbling it up and they have been in picky moods for a while (newly 3 and newly 5 year olds). I used chicken stock as I never have veggie stock on hand but I also figured that might give it a more robust flavor? I’d love to try it with veggie stock one day but I love it as is! I like mushy veggies so I added the whole red pepper, funny enough my boys love raw red pepper so i bet theyd have loved it either way. The flavor is subtle but still good as-is but I might go a but heavier and tweak this a bit later but I can’t stress enough I love it without tweaks! Besides me using chicken stock . This was easy and fast and I feel like it’s light enough to have in the summer too! The sweet potatoes add a lovely flavor. This is going into regular rotation. My three year old has been asking to be fed lately but we have to push him a bit (which I hate doing but he’s skip dinner completely and ask for junk later if I don’t push him at least a little) and he’s opening his mouth saying “ahhh” looking for more. That is so rare with this child! Which is why I even cave to feeding him even though if I told pre-mother me I was doing this I’d judge me! 🤣 anyway, try it. Even with the tsp chili powder there’s no spice for the spice averse. Kick it up if you want more. Or so what my Indian husband does and add in Siracha! I can sub with chicken stock but wondering what flavor/ health advantages there are for the veggie stock? To be honest, I use veggie stock because I can basically make it for free. I just collect all of my veggie scraps in a ziplock bag and keep stored in the freezer until I have enough for a batch: you can read more about how to do it here. With this method I always tend to have a batch on hand that is full of organic vegetables and has a lot less salt that the commercial brands. When I have a chicken carcass I make chicken stock instead and would totally use that in place of veggie broth. Does anyone happen to know the macros on this? I dont, but if you try out MyFitnessPal, I have heard that is very good at helping you to work out such things. Good luck. I made this for dinner tonight, and it was delicious! I plan to double the recipe, and make it for weekend company whose arrival time is indefinite … it should hold well if they’re really late. Yummy, and both of us give it 5 stars! Love this! I’m curious if you have tried doubling this in your instant pot? I’d like to make a double batch for a friend. If so, or even if not, do you have suggestions for how to adjust the cooking time? Thanks! I haven’t tried doubling it Jamie, although I really should so that I have a freezer supply! I wouldn’t want to give you specifics given I haven’t tried it myself, but usually if I double a recipe in the Instant Pot i don’t bother adjusting the cooking time and it works out just fine. It will just take longer for everything to come to pressure. If you try doubling I would love to hear how you go! I went ahead and tried it! I doubled the recipe and added just one minute to the cooking time and it turned out superb! Doubling it brought it right up to the max fill line, but it worked! Awesome, I am so glad it worked out for you!! I am totally doubling it next time, it’s a handy one to have in the freezer 🙂 Thanks for popping back and letting me know. I️I️I️ made a double batch and it was perfect. Thea know you! I bought an older model, and that tiny section of the manual just wasn’t very clear. I appreciate you clarifying. Except for subbing in moose meat for the turkey, I followed your recipe exactly. It was easy, very tasty, and a big confidence boost for using this Instant Pot more. So good Donna! Thanks for all the wonderful recipes!! Oh thank you Abby 🙂 Glad you enjoyed!! 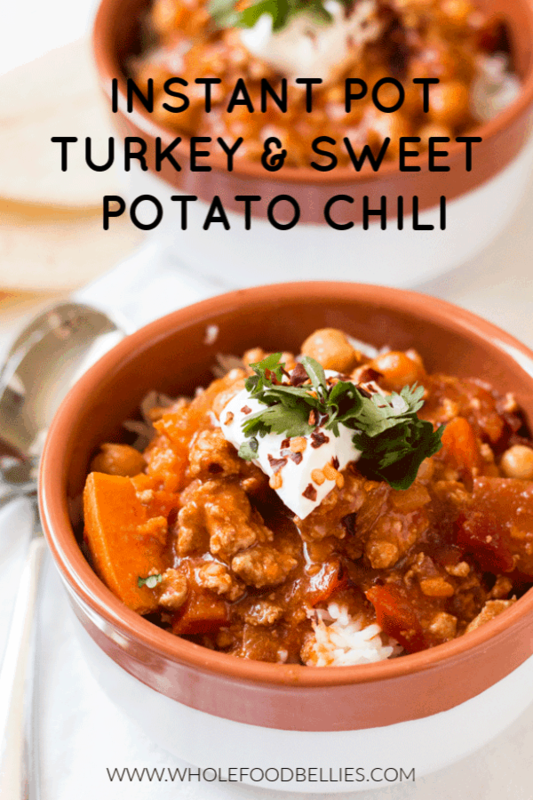 I made this turkey-sweet potato chili and my entire family LOVED it! Thank you for inspiring me in the kitchen, Donna! I did not stray from the recipe, though I did make a meat version and vegetarian version for 6 people in my family with plenty left over for freezing. I tripled the recipe. My children will not touch sweet potato so I baked those first and mashed them more than dice. We all loved it! Oh that makes me so happy Blithe, what a lovely message to wake up to 🙂 Thanks so much for taking the time to come and leave a comment, and I am so glad you loved it!! When you tripled the recipe did you have to increase the cooking time in the instantpot? I am an instantpot newbie, so would love to hear how extra ingredients affect cook time. Can’t wait to try this recipe! I make this yummy chili often since it has become part of our regular rotation. I have doubled it and not changed the time. It does take a while to come to pressure since the pot is pretty full. I always set it on Manual for 6 minutes (instead of 9) because we like the sweet potatoes cooked but not squishy. 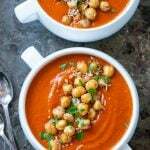 I also often add an additional can of chickpeas, and a bit more chili powder than is called for — the recipe is very versatile. Thanks for sharing your experience Nancy! “My husband is a massive tight-arse” – serious literary gold, right there!! I have an off brand of an instant pot – it doesn’t have the saute option, so I’ll use a skillet to do the first part, then bung it all in the cooker for the last. So yum! I don’t have an insta pot but love using my rice cooker for chili & soup. Can’t wait to try this. This is the perfect chili for winter! So hearty with lots of warm spices! Great recipe– pinning for later! This looks delicious! I love all the hearty ingredients. Looks delicious! And fast, it doesn’t get much better than that. My friend has an instant pot and she just loves it! This recipe looks really, really delicious! We are addicted to ours 🙂 Makes life so much easier on those busy days!